Picking skincare can be truly daunting. I don't shop for it very often anymore, since I've achieved super-tester status and probably have enough samples to last a decade. That being said, my love for understanding ingredients and exploring the latest innovations in hydration grows each and every day. 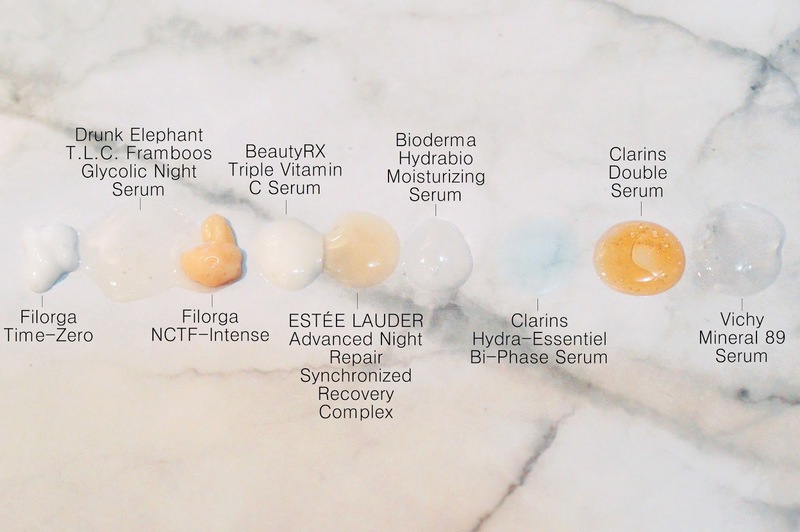 Here are 10 awesome serums that I keep in my Cosmetics Organizer to cure a multitude of sins. What is a serum supposed to do? After these steps, your skin will be free from dirt and ready for a plumping, rejuvenating, game-changing elixir. Enter: serums. Jam-packed with a high concentration of active ingredients like Vitamin C, Hyaluronic Acid, Glycolic Acid and Niacinamide, serums sink into the skin immediately and work like a multivitamin for your skin. Use one daily and always top with a moisturizer before heading to sleep. Most serums (marked with a sun emoji) may also be used in the morning to prep before moisturizer. With a similar feel to Estée ANR (below) Time-Zero combines their zero wrinkle concentrate and intense lifting gel to visibly reduce all types of wrinkles. It's very comfortable and soothing, leaving my skin moisturized and smooth. I will use this morning or night. The $90+ price tag on Drunk Elephant's 12% AHA/BHA night serum was hard to swallow, but I can assure you that this lives up to the claims. This simple clear serum helps refine and resurface skin, revealing a smoother and more radiant complexion while also clearing the way for maximum absorption of moisturizer. Glycolic acid lifts dead skin cells away by dissolving the glue that holds them to the skin's surface. It's as if you're scrubbing with a cloth, but without the manual effort. This blend of Glycolic, Lactic (❤), Tartaric, Citric and Salicylic acids will give you a deep chemical exfoliation without harsh side effects like dryness or sensitization. Excess oiliness and enlarged pores will appear dramatically diminished. Filorga's New Cellular Treatment Factor serum is a blend of Hyaluronic Acid (plumps wrinkles immediately, improves firmness and radiance long-term), Encapsulated Retinol (stimulates elastin production to fill in wrinkles long-term), Plant DNA (strengthens elastin fiber network to restructure skin), and Vitamin C (homogenizes skin tone and brings radiance).With continued use, this serum can help you achieve outstanding results in improving skin tone and texture - similar to invasive retexturizing treatments. Follow-up with the NCTF-Reverse cream to combat dry skin and heal any imperfections overnight. I freaking ADORE BeautyRX. Their vitamin C serum is different than every other one I've tried, and there have been many (v expensive) ones. It is a plain texture with no strange sour scent or gritty texture that often comes along with Vit C products. It is hydrating, luxurious, anti-aging, and leaves skin smoother, brighter, softer, and more youthful. It contains three of the most effective forms of Vitamin C and absorbs three times faster than other Vitamin C Serums. This serum has also been proven to reduce the appearance of hyperpigmentation and dark spots. Another must-have from the brand: The Progressive Glycolic Peel. love. it. My first encounter with ANR was when I walked into Sephora looking for a quick fix for my perioral dermatitis. Though I did end up getting a tube of Hydrocortisone cream to battle it once and for all, the Sephora associate sold me on Estée's ANR and I didn't skip a day of use the moment I cracked it open. Rich yet light-as-air, this plumping serum makes your skin look better immediately. It balances my oil, combats dry flakes on my nose, keeps acne to a minimum and improves my tone and texture over time. I love how this can be used by teens, women, men, under makeup, on it's own, morning and night. The scent is classic yet undetectable, and this no-fail skincare product is almost guaranteed to work. Hello, drugstore hero! Bioderma is a leader in skincare for all skin types, from their award-winning Micellar Water to their Cicabio cream for damaged skin, you can't go wrong here. Confirmed by my fav gal Sandra in her YouTube vid, this serum is a lifesaver for combo, acne-prone skin that needs a drink of water to settle any redness and help spots heal. I'd recommend this as a moisturizer-prep for anyone, with any skin type. I also really like their Hydrabio Gel-Cream Moisturizer over top in the morning, and the thick Moisturizing Cream at night. First reviewed here, this serum feels like water, and is suitable for all skin types. Shake it up, then apply one pump all over the skin. As light as it is comfortable, this intensely hydrating bi-phase serum quenches irritated, dull, and uneven skin. Organic leaf of life extract, a powerful natural hydration activator that boosts the skin’s hyaluronic acid production. This "sponge molecule" holds more water in our epidermis for optimal plumpness and a smooth, glowing complexion. I'm left with no dry patches at all, and this serum eradicated some stubborn dry skin around my nose and chin all together. Reviewed recently here, Clarins re-released their famous bi-phase serum last year. Double Serum promises to "decode the language of youth" by boosting the skin's vital functions. This high-potency serum contains a cocktail of Plant Extracts and has a lighter texture than the original. This product is great for those who need an intense repairing treatment overnight, but I find that it provides too much oily and moisture on my oily days. I'd recommend it most for those with dry skin, especially in the winter when nothing else seems to cut it. The refined pump system can be adjusted to dispense only a small amount, or a large amount, and it keeps both parts of the serum separate to guarantee a fresh mix of ingredients upon each use. I stand so firmly behind my rating of 10/10 on this calming serum from Avène, and I'm very pleased that it won in FASHION'S 2017 Beauty Awards. If you've read my blog before, you probably also know that Avène is one of my favourite skincare brands. This serum is luscious, smooth, delicately fragranced and sinks into the skin like a cloud. There's no residue, only plump and hydrated skin. I adore their Soothing Moisture Mask and Light Hydrating Cream, and this serum pairs wonderfully under both. This serum is like a big drink of water for your skin. Containing 89% Thermal Water with Hyaluronic Acid, your skin will be full of life and moisture, protecting against external aggressors like pollution and cold weather. It boosts hydration to replenish the skin's moisture barrier, meaning your skin will be healthier and more radiant overall. I forgot to include my Avène Hydrance Optimale, but you can see an image here - it's a light, milky white colour with a very smooth and cloud-like texture. Which serum should I try next?